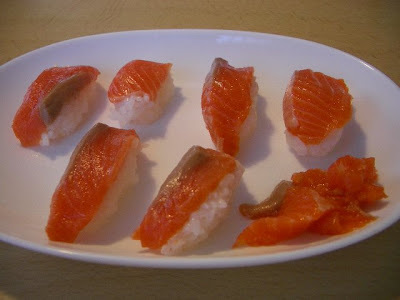 I made nigiri zushi (< sushi) for supper tonight. I used only salmon as toppings. I used leftover cooked rice to make “shari” (vinegared rice). I reheated the rice in the microwave for longer than usual to evaporate excess moisture and make the rice suitable for making shari. 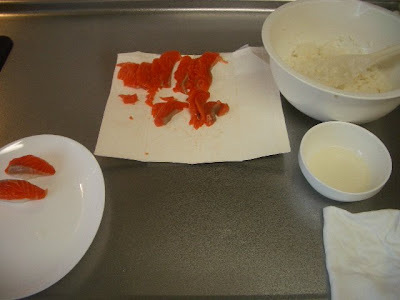 I transferred the rice into a bowl, and added a 1:4:6 mixture of salt, sugar, and vinegar. This ratio is from a book written by Yoshihiro Murata. 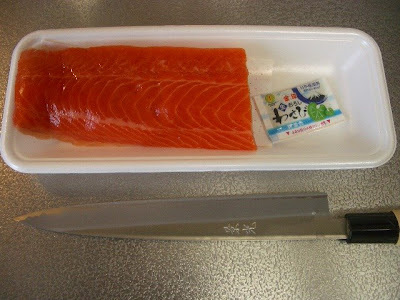 I cut the salmon fillet diagonally into slices measuring about 8 x 3 x 0.5 cm, using the sashimi slicer. 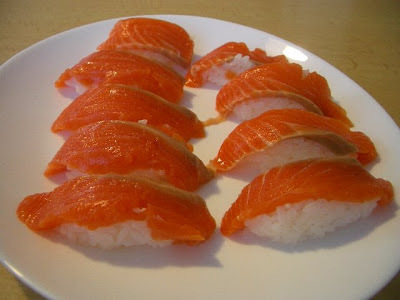 The quality of shari is critical to sushi, so I will elaborate it a little. The rice has to be very hot (just cooked) for vinegar to seep through each grain of the rice. After you add the salt/sugar/vinegar mixture, move a shamoji (rice paddle?) in a cutting motion to mix them thoroughly. Don’t use a fan to cool the rice in this step. After you have made sure that the rice and the mixture are mixed together thoroughly, use a fan to cool to hitohada (human skin temperature).